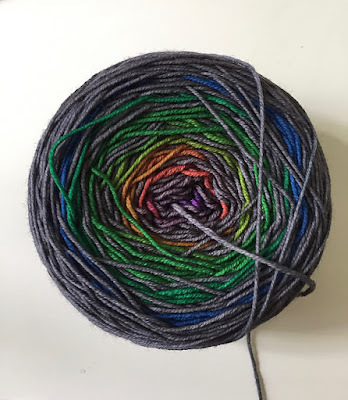 My Journey to Fit: FMM - Knitting! It feels like forever since I've knitted anything other than baby items - and next week I'll have more of those to show you, but once I was finished with knitting for two special babies, I cast on something completely different - a shawlette. I don't make many of these, for a couple of reasons: one, they are bigger projects and I tend to lose interest and set them aside for long periods of time, and two, I don't wear them very often because it's so warm here for most of the year, and I also don't work, so I wear t-shirts most of the time. Gauge Dye Work's merino twist, in Concrete and Tulips colorway. And it was just different enough that I decided to knit it up. Backstory is that I bought this yarn several years ago because I was intrigued by how it was dyed to stripe in the same width for a top-down shawl. But...once I got it, I remembered that I really don't like top-down shawls - the shape feels a little too old-ladyish for me. I prefer the smaller, more triangle-shapes of shawlettes. So I set the yarn aside and checked Ravelry occasionally to see what other people were making with it - waiting paid off because another pattern was written specifically for this yarn, and it was much more to my liking. It didn't take me long to finish this, which surprised me. The pattern is fairly simple, but my brain still had to work at computing it, and I have no shame in telling you that I needed to refer back to the pattern at the start of each row. 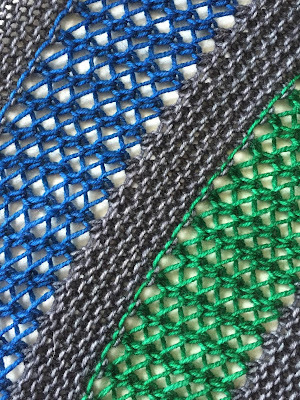 I also got good at fixing mistakes in the beginning, which is challenging where there are yarn overs and decreases - that is hard to see to undo! I liked how the shawlette turned out, and I'd recommend the pattern - plus it's free, so that was a nice bonus! Looks like solid stripes of color, right? Close up - LOOK AT HOW THE LACEWORK OPENED UP! There is a big delay in gratification when you knit anything with lacework in it but oh man, when the payoff hits, it hits big! I am really pleased with how pretty this looks. OK, it's the towel rack in my bathroom, but you get the idea. Another way - this seems a little more modern, less rocking chair-style. 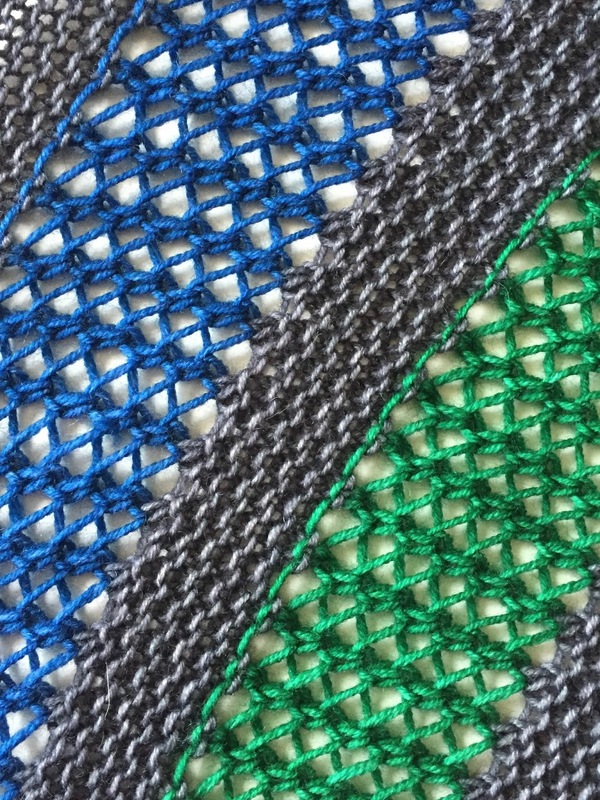 I am very happy with this shawlette, which is pretty obvious. Not sure when I'll get an opportunity to wear it considering our current hot weather situation, but one day it will be cool and I'll be the stylish shopper at the grocery store, wearing my handknits! Amazing difference in the before and after pictures. Great work! 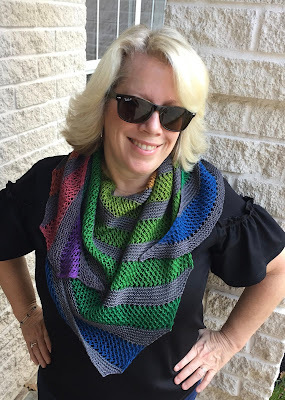 I like the "modern" version of the shawl better and that's saying a lot since I usually don't like cowls. Thanks Susan! And I guess in Florida, you don't have a need for cowls or shawlettes, right? That is SO PRETTY!!! 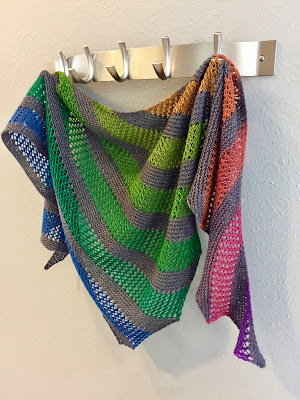 It's just amazing how the yarn stripes in those long blocks of color from gray through all the rainbow of colors. I know where you could wear it every night-- I think you need to make a trip to California just for your shawlette. I'm going to check out that free pattern too! And when I get home I'm going to block that lace shawlette that I knitted after my surgery--you've motivated me! Sigh, I need a trip to California! Still a ways off, unfortunately. Oh my gosh, that is gorgeous! And it looks great on you. I had no idea what blocking was. I only know that as a football or internet term LOL. Does every piece have to have that done to it? Thank you! Yes, every knitted item should be blocked - even if it's not lace, it smooths out the stitches and also, it's good to get the piece clean after being handled so much during the knitting process. That is beautiful! Now I understand why you like making socks and baby pieces! I am working on a pair of socks right now, but it's nice to change things up once in a while. I've missed your knitting posts. I still need a project. I'm sick of socks but they're so portable. Very pretty! And cool how it changes with blocking. BTW, you said you don't work, are you not volunteering at the gift shop anymore? I still volunteer at the gift shop - guess I shouldn't discount that, right? But I have to wear a uniform there, so I didn't include that as a "dressing" opportunity. Ok, so that is just the coolest yarn! How do they do that? The shawl turned out amazing! I love the colorway of your yarn and the shawlette is quite lovely, I love how it looks on you in the more modern wrap way. It turned out SO fabulous! Yay for waiting and finding that perfect pattern. It's amazing how much the blocking changes it!!! !